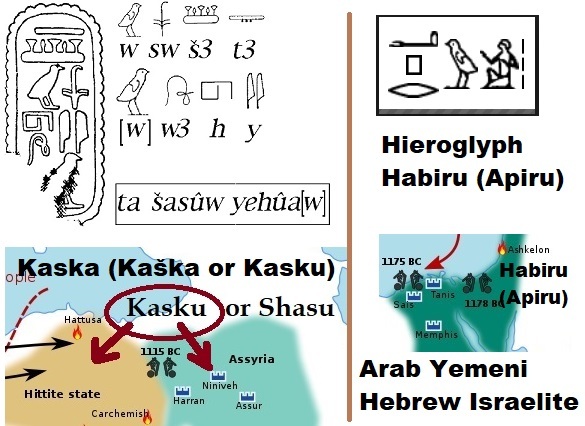 The mysteries of “Shasu” and “Habiru” in ancient Egyptian records are solved this way. WHAT A LOAD OF BULLCRAP! According to my “Punt Land Hypothesis” the origin of the “Hapiru” and “Hebrew” were from the Judah tribe. Around 1000 BC, some or most of the Judahites were assisted by Turkic Mongolian bandits, who became the Sabaean, in their colony of D’mt in their fight against the other tribes of Israel. Soon after the death of King Solomon the Judahites renegaded more and collaborated with other Turkic-Mongolian groups attacking Kemet (ancient Egypt) from the east by ex-Hyksos and Mitanni Kurds, and from the south by bandits which created later on the Kush Kingdom in 785 BC. At this early stage they were identified as the “Hapiru” only. In 580 BC the Judahites were invited to Neo-Babylonia to assist in inventing the Hebrew Torah, the Hebrew language, and the Jews. Then they were called the Hebrew Israelite.